Besides being cute, the HZL-27Z has an Automatic Needle Threader. Just lower the lever, turn it back and forth and your needle is threaded. 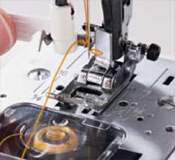 Brightens the needle area and the LED light will not heat up, even during extended sewing sessions. Easy to Use Stitch patterns can be selected using the large easy-turn stitch dial. The Reverse lever is just the right size and conveniently placed. It's so simple to prepare the bobbin thread.Want to know how much bobbin thread is left? Just look through the transparent bobbin cover. With the 7-point feed dog, you can be assured that any weight of fabric will feed evenly and consistently through the machine. Needle positions and zigzag width can be adjusted with a simple turn of the dial. Remove the accessory table and the HZL-27Z is ready to handle cuffs, pant legs and more. Create balanced buttonholes easily using the built-in 4-step buttonhole option.